By Guest Columnist LEE BIOLA, president of Citizens for Progressive Transit and a worker’s compensation lawyer. Georgia built a world class public transportation system. Georgia destroyed a world class transportation system. Georgia can build a world class transit system again. It was 1836. Georgia legislators sitting in Augusta voted to fund a taxpayer subsidized rail line out in the middle of nowhere. They wanted the line to run from one obscure dot on the map to another. It was the best investment the people of Georgia ever made. One of those dots on the map became Atlanta. The other became Chattanooga. The tax-subsidized rail line helped transform tiny communities into economic powerhouses. Following the state’s investment in rail, for-profit rail companies built lines into Atlanta from every direction. Passenger rail lines ran to places like Savannah, Brunswick, and Valdosta. In the early twentieth century, Georgia communities as small as Albany and St. Simons Island had electric streetcars. Electric streetcars would meet you at the train station in towns across Georgia and take you where you needed to go. Streetcar lines were the skeletons on which Georgia communities grew. In the 1880s, Joel Hurt, a private developer bought up land between Atlanta and Decatur. Hurt used private money to build the city’s first electric streetcar in 1890. He ran the tracks from downtown Atlanta to his land in the middle of nowhere. The tracks quickly made his rural property very valuable. The streetcar line allowed him to sell his land at a sizable profit to people who built mansions, houses, and businesses in the neighborhood that became Inman Park. By the 1920s, developers like Hurt had created 25 electric streetcar lines running throughout the city of Atlanta. Atlantans could ride the streetcar downtown and connect to streetcar lines that took them to other neighborhoods. They could take commuter rail lines that took them to suburbs such as Chamblee and Smyrna. They could take passenger rail to Macon or Savannah or express trains to New Orleans, New York and elsewhere in North America. Georgia had a world class transportation system. So what happened? In 1916, Georgia legislators made a major change of course. Following the federal government’s lead, Georgia created a Department of Highways that could only subsidize travel by car. Massive subsidies for cars could not immediately kill private rail companies. But decades of that policy eventually did. In the 1940s zoning laws began to force businesses to set aside land for free parking. The costs were passed on to customers whether they owned cars or not. Streets were widened and sidewalks were left unbuilt. While transportation officials made car travel priority number one, the commercial rail system and walkable communities that depended on it withered. The federal government began a massive tax subsidized highway interstate building program in the 1950s. This was the nail in the coffin for for-profit transit systems, and the beginning of the end for commercial intercity passenger trains. The effect on Georgia cities was devastating. While metro Atlanta outside the city limits became the fastest growing settlement in human history, its core, the City of Atlanta, actually began to shrink. New highways were attracting development to the countryside around Atlanta. The Department of Highways completed I-285 in 1969. During the 1970s, the core City of Atlanta lost nearly 15% of its population. Like Georgia legislators of 1836, Fulton and DeKalb County voters decided it was once again time to invest tax dollars in rail. They voted to raise a one cent sales tax to fund the MARTA rail system. The first MARTA rail stations opened in 1979. With some rail service in the 1980s, the core city’s population loss slowed to 7%. As the MARTA system and the communities around it began to mature in the 1990s, Atlanta’s population began to grow again. The MARTA rail system made it possible for Atlanta to host the 1996 Olympics. The last MARTA station opened in 2000. From 2000 to 2008, the core City of Atlanta’s population exploded 29%. One look at the city’s skyline shows where much of the new development went: right along the MARTA line. Of metro Atlanta’s twenty-five tallest buildings, twenty have been built since 1979. Every single one of those buildings is walking distance from a MARTA station. Savannah is the most recent Georgia city to invest in rail. It opened a small streetcar line in February 2009 that has grown in popularity during its first year. City officials there are expanding hours of operation because they have found that the rail line, like so many rail lines before it, is attracting economic activity to places it would not otherwise go. Previous generations of Georgians invested in rail. They showed it can be done right here. We are the heirs of these investments and we benefit from this inheritance every day. To whom much is given, much is expected. We have a responsibility to expand our investment in rail for future generations just as previous generations did for us. Lee Biola has been a champion of public transit through his role as president of the Citizens for Progressive Transit. Here is Cfpt’s vision for transit. Biola also wanted to highlight the Transit Planning Board’s Concept 3 plan for a regional network of transit. Lastly, to show how much we’ve lost, here is a map of all the transit lines that existed in Atlanta in the 1940s: (just keep clicking on the links). Our shared story — are those things that make us New Englanders or southerners more connected than we may think? I love rail. But the fact checker in me finds the commentary below completely dubious. The cause and effect is suspect. Atlantic Station, Atlanta’s largest new development isn’t on a MARTA line at all. Many of the other buildings in Central Perimeter were built prior to the line extension there. While no one doubts that transit increases the potential for density and efficiency, the reality is Atlanta has grown significantly for a list of reasons completely exclusive of MARTA. But I’m all for more (dedicated right of way) transit. The old map is nifty. “Yr1215”, You are correct in that Atlantic Station is not actually built directly on a rail line that is currently used for local or regional passenger transport. Atlantic Station’s developer, Charles Brown invisioned having a light rail line run thru the development to connect it to Arts Center Station. I’ve had several conversations with Mr. Brown on this very subject. He informed me that he had the south edge of the deck, along Seventeenth Street specifically designed to structurally handle light-rail transit trackage and trains. It is my understanding that this also applies to the structure of the Seventeenth Street Bridge. Obviously, that line has not yet been built, but it is included as a component of the Concept3 Transit Master Plan. In fact Atlantic Station figures prominently in the Concept3 plan on several lines. It could be legitimately argued that if Mr. Brown’s group had put up a down payment for the first segment of the line that perhaps that portion could have been built. I do not know that he didn’t offer to do just that; but, as we know too well, having funding up front is by no means guarantee in Georgia that there will be matching funding from the state. I must point out however, that Lee Biola’s point that all of the largest area projects were built within walking distance to a MARTA station holds true even for Atlantic Station. My last job in Atlanta was located at the corner of Peachtree and Seventeenth Streets. My coworkers and I would routinely walk past Arts Center Station, and cross the Seventeenth Street Bridge to have lunch in Atlantic Station. True, the bridge presents a large exposed obstacle for pedestrians; especially on hot summer or cold windy winter days, but people do walk it or bike it. Also, there is a regular and frequent shuttle service linking all points within the development to Arts Center Station. This indespensible and heavily used service is provided by the development for the Atlantic Station residents, workers, and those who frequent the business establishments. This editorial concerns me deeply. I have always believed that progressives who advocate for things like smart growth, public transportation and other urban issues have done so from a place of facts and real analysis rather than ideology, ignorance, racism or other nonsense. This piece disturbs me because we are now crossing the line with many spurious and revisionist connections between history and reality. Georgia railroad development was linked to some of the worst unethical, illegal, corrupt and criminal activities in the history of state government. The Trail of Tears as well as slavery played a large role in the development of the early Georgia rail system. Franchise agreements and the taking of land by private corporations were a big theme. While there were certainly economic benefits to the railroad network and it can be used as a basis for a new rail passenger system, let’s not claim that it was built out of an ideal or destroyed entirely out of subsidies for cars. The railroads themselves played no small role in the elimination of many passenger services. The depopulation of the city had to do with school desegregation and white flight than it did with the state of the transit system. Again a spurious cause and effect. This article is great, and makes lots of good points. I just wish that it recognized that many of them apply to much-needed bus services as well as much-needed rail. I’m not one of those who says that rail should be usurped by buses, or that buses are always more efficient for everything, and so on and so forth, but I do believe that each mode has its place in a well-developed transit system. I have to take issue with the rail focus of this article, for this reason. Buses are an important part of Atlanta’s transit history, present, and future. The Atlanta 1940 Streetcar Map is, in fact, a map of a multi-modal transit system. Every red line on that map is a bus. Every dashed green line is a trackless trolley (electric bus). Like the system we once had, the MARTA system as we know it is a multi-modal system too, with buses feeding rail lines. And, not that you could tell from Mr. Biola’s article, the MARTA sales tax was passed to fund not just the rail system, but the bus system too. It’s also important to note that in MARTA’s current financial crisis, the bus system is slated for a major reduction – as a result in the decline of receipts of that very tax. There are, and will continue to be, places that rail – heavy, light, commuter or streetcar – can’t go or wouldn’t make sense. It is simply not smart, nor feasible, to leave bus transit out of the discussion. It is also not smart, nor informed, to imply that a great transit system relies only on forms of rail service. It is not the Progressives who are revising history. Lee Biola is simply pointing out that the system was at one time in place; it worked well, and served Atlanta well. Then we squandered it. How it came to be is valid history, and it should be understood and honestly taught in our schools. To take your argument to its conclusion, everything that is Atlanta, everything that is now Georgia and America was once the domain of the Native Americans. That includes space that you now occupy, and lay down at night; and also the space where you work. Should all that be dismantled for the manner in which it entered our domain? Perhaps so, but it will not. We should still try to make Atlanta the best place possible for modern day Atlantans, while still seeking to understand our honest and unfiltered history; if that is possible. I think atllin83 made an excellent point. World-class transit systems are more than just great rail systems. They are multimodal systems with multiple layers of service (intercity rail, urban heavy rail, tram/streetcar, and bus). While these systems are common throughout Europe and becoming increasingly so in Asia, only our largest cities (NYC, Boston, Chicago and LA) and Portland are close to even achieving true multimodal systems. CFPT’s World-class transit plan was a start for Atlanta but only had a smattering of BRT corridors. Concept3 takes the bus expansion concept a step further; however, it generally misses the target by identifying far too many nonsensical suburb to suburb routes. Most of the Arterial BRT routes are reasonable and were actually part of a bus-centric plan that GRTA shelved almost a decade ago. I truly respect the transit advocates and their unwavering support for something that’s a necessity for this region. They just need a reality check. Look, this region and state are seriously broken. MARTA has serious problems. Sonny’s transportation plan as it currently stands and if it ever makes it out of court, will never make it through a referendum. Any positive change that Barnes can bring regarding transportation is a few years off. Bold actions are only going to come in small measures. ARC or a “coalition of the willing” will need to pick a couple of projects and find a way to make them real. If Cobb or Gwinnett want LRT anytime in the near future, they’ll need to increase their millage rates/sales taxes to improve their background bus services and get it going. Maybe GDOT will then, god-willing, come along and connect them via I-285. On a smaller scale, if Atlanta wants a streetcar project, it’s going to need to at least put up a local match to get federal assistance. I recently downloaded the updated version of this to see if a clarification now finally existed. To my dismay, despite its’ title, the document’s contents seem to simply reinforce the vagueness. We’ve run into this issue several times in transit advocacy in Atlanta especially during the FTA mandated Alternatives Analysis phase of a planned project, such as the Belt-line. In this case, MARTA planners presented elaborate photos of some of the most sophisticated systems in the world. 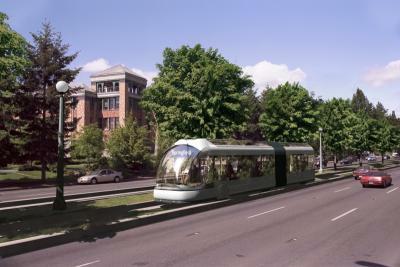 One of the images, most impressive to the viewing audience was an artist rendering of a BRT system, which I’m not sure where it was supposed to be or if it even exist(see similar image at http://ti.org/EugeneBRTFantasy400.jpg.). The tires of this train-like vehicle were moving on track-like parallel narrow concrete running pads, with turf in-between for each bus-way suggesting something other being manually guided. However, we later witnessed MARTA referring to the operation of standard city buses operating on slightly modified freeway emergency service aprons as BRT. It was when we sought to call them on this, and we researched for an official BRT definition that we discovered that a definition that we could hold them to didn’t actually exist. The bait-and-switch routine is very easy if you provide a vague definition. For this reason I and others will always be dubious when BRT is matched up against rail-based modes as an alternative transit mode. Some of our streetcar history was recently unearthed during the current renovation of the streets and sidewalks on the Marietta Square. Just 4 inches beneath the street surface lay the streetcar tracks. I had seen pictures of the streetcar in the Square, but seeing this physical evidence of that long gone service was a bit overwhelming. The streetcar line was probably forgotten by most Cobb voters when they turned down MARTA. I believe Concerned Transit Advocate is correct in his history. And I didn’t need to dig up any streets to know that the tracks are still there. I’m impressed that CTA is considering the past as he looks to the future. CCTgirl, do you mean we need to discover some new sort of transportation rather than use steel wheels on steel rails(swosr)? I’m not sure what you are saying. But using swosr as a method of transportation gives the tightest concentration of passengers and the longest lasting vehicle and the best chance of getting to the destination on time. When a highway is moving smoothly, you have one point one persons (Atlantans have only one car in 10 with more than one person) for every 50 or so feet of lane. With lanes being 10.5 feet wide, that means that one person takes up 525 square feet of space. In a railcar, a person sits in a seat which takes up roughly 1.5 feet wide and three feet between seat backs for a 4.5 square foot space. Buses take up the same space per person but do not last nearly as long as rail cars nor are they able to bypass traffic but must ride out most stop and go situations.